Many of America’s iconic and historic coin designs from the 20th century live on today on various gold and silver for sale. The United States Mint has revived images such as the Buffalo Nickel artwork on gold bullion coinage, but you don’t have to pay high premiums of spot prices in order to get your hands on some of the many coveted designs out there. 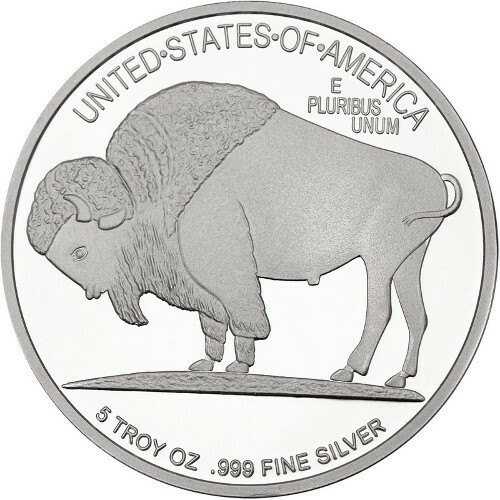 The 5 oz Silver SilverTowne Buffalo Round is a great way to get those same designs for much less, and it is currently available to you for purchase online at Silver.com. Ships to you inside of a protective package! Brings to life the Buffalo Nickel design! On the obverse face is the effigy of a Native American. The reverse side includes the design of an American bison. Original artwork from James Earle Fraser. James Earle Frasers design for the Buffalo Nickel came along during a period known to some as the Golden Age of American coinage. President Theodore Roosevelt ordered a redesign of all American coinage starting in 1905 and the drive to reinvent the nation’s currency would carry on well into the administration of President Woodrow Wilson. 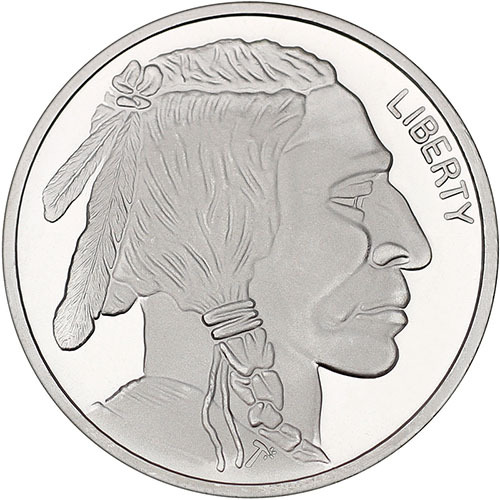 Fraser’s design for the Buffalo Nickel, sometimes known also as the Indian Head nickel, was inspired by his own life growing up on the plains of the American Midwest and Upper Midwest. His vision of a Native American figure and the bison which were so vital to their way of life graced the five-cent piece from 1913 to 1938. In fact, Fraser was once a student and assistant to Augustus Saint-Gaudens, the legendary artist whose Liberty design for the $20 Gold Double Eagle is heralded as the greatest American coin design of all time. The reverse of the 5 oz Silver Buffalo Round includes the image of an American bison, better known as a buffalo. This massive beast is the largest land mammal on the North American continent and it was vital to the survival of plains tribes. The furs were used for clothing, hides for housing, and the meat for sustenance. These 5 oz Silver SilverTowne Buffalo Rounds are available to you in individual packaging and feature .999 fine silver. If the Gold American Buffalo is too much for you, this silver round for sale is perfect with its much lower premium over the spot price and same beautiful artwork.